Inder Loves Folk Art: November. Happy November! For me, that means a new billable year at work and the chance to relax a little bit after the most hectic month of the year. Of course, there is still work to do, but some of the pressure is off. Whew! But it also means I can no longer argue with the changing seasons. Let's just get it out there: I'm not a Winter person. Blech. There isn't much romance in wet, dreary Bay Area winters. The end of daylight savings is tomorrow, which means that for the next couple of months it will be pitch dark when I get home from work. And we're already freezing our rears off in our high-ceilinged, uninsulated, underheated Victorian house. Seriously, I would not be surprised to learn that in 1896, Oakland homes were constructed from balsa wood. I swear I can feel the wind coming through the walls. Although our winters are very mild, the inside of our house is usually about the same temperature as outside, and our mild winters are not nearly mild enough for that! We have been holding out and have not turned the heater on yet, because (a) it costs approximately one million dollars a month to operate; and (b) it doesn't actually warm the house up that much. But I don't know how much longer we'll be able to stand wearing hats and gloves in the house. But. At least we don't have to shovel snow or try to extricate our cars from three inches of ice every morning. Joe's rocking his fleece footie sleepers now. Yes, he bonked himself in the eye. It's almost healed up now. I've been overflowing with sewing inspiration lately but not actually sewing. You know how that goes. I may be suffering from idea-overload. I have fun projects in the works for me, and I also want to make Joe some really cozy clothes for our cold house. I also want to make Joe some really warm fleecy slippers. Everyone in this house needs slippers: socks don't quite cut it here, what with the draft that seems to seep through the floor. The slippers that Target sells are cheap and ugly and I know I could do better. For that project I've been eyeing this tutorial from Folkhaven. I was thinking I could probably find an old, ugly fleece at the thrift store that would be perfect for some recycling (have I mentioned that the word "upcycle" bugs me? I can't approve of all of these new words the youngins keep making up). 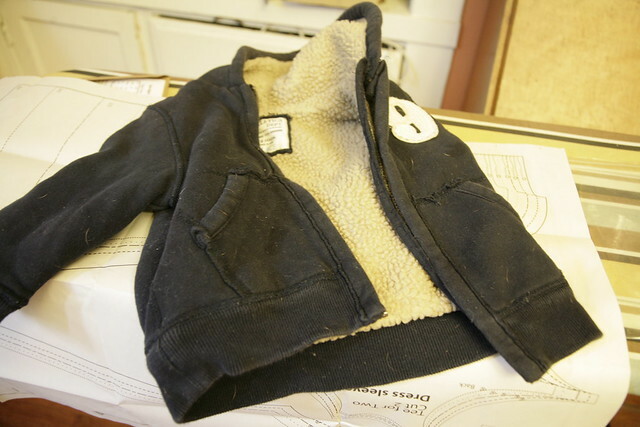 Sewing For Boys also has a great sweatshirt-style pullover pattern, so I'll need a men's large! Speaking of sweatshirts, I could use your thoughts: Here's a lovely, warm, shearling lined hoodie of Joe's. The zipper is broken and I ripped it out. Should I replace it? Or should I do a refashion and make it a pullover like this? Ideas? Excuse the dog hair. That's par for the course in this house. That's it as far as craft news! My fingers are frozen just typing all of this out! Have a great weekend, everyone! 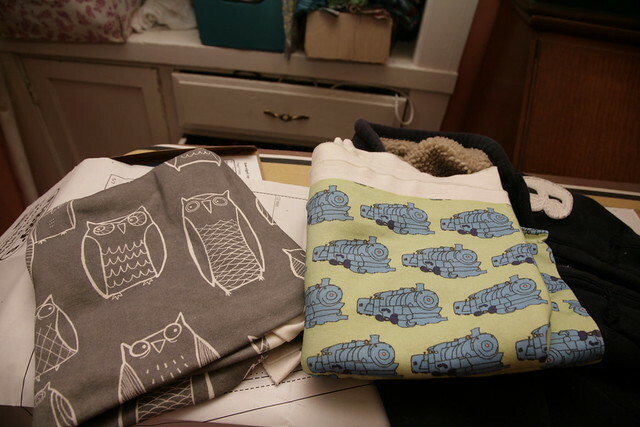 OMG I love that owl fabric!! Must resist urge to buy...Elena loves owls too :) I can't promise I won't buy it :D Can't wait to see what you do with it! How much room is in the hoodie with Joe in it? If it has enough to make it into a pullover that would be so cool! I'd worry if there'd not be enough room and then you get a sweater you can wear for like 2 days before he outgrows it. 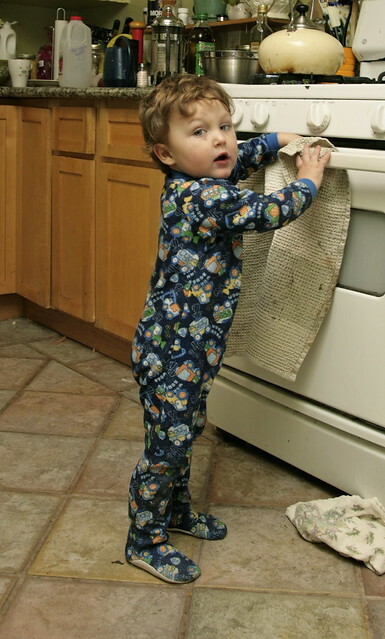 Also, Joe looks so cute in his footie pjs...and the word upcycle really bugs me too. Ooh, I see your Spoonflower knits have arrived! Love! Aren't they so lovely and soft and a great weight? I know what you mean about 'so many ideas' and hard to get started. I had to just launch into churning out t-shirts this weekend so I don't just end up with an overflowing fabric stash and me frozen in Libran indecision. Hmm, busted zip... I've never attempted replacing one. Maybe yes, if it looks easy to get at and replace. That re-fashion looks cool but possibly a bigger job. And I don't think I've ever willingly used 'upcycle' either. I mean, it sort of has a specific meaning now, but recycle is probably just as good. I also have an aversion to 'vintage' since it's now applied willy-nilly to anything older than yesterday to make it sound cool. 'Second-hand' or just plain 'old', anyone? First of all, you ladies crack me up (in a good way): I have found my sisterhood of grammar/syntax police! Love it. To answer your questions: The hoodie fits Joe now, and he's growing up and not out, so I am torn. Replacing the zip could work (I might give it over to my local alterations people to do a great job) but a refashion could work too. And the thing is, if I put a hoodie on Joe, I am likely to zip it up - otherwise, he takes it off! So. Hrm. Folkhaven: Don't be sorry! I'm in the minority here! It's me against Etsy; a futile battle. Haha. Jane: I'm totally guilty of "vintage." By which I mean, "old and cute," of course. There's no hard and fast age limit. I feel you on your thoughts about winter...winter solstice cannot get here soon enough. The lack of daylight just about kills me every year! On a more positive note - your new fabrics are freaking adorable and I can't wait to see what you make with them!